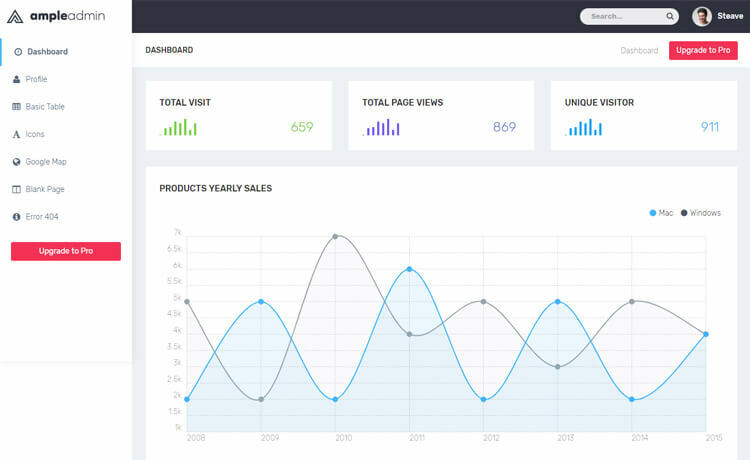 Ample Admin is a free HTML5 admin dashboard template. It has features like widgets, dashboard overview page, charts, basic tables, and profile page are bundled with it. Ample Admin is a clean, simple and minimal free HTML5 admin dashboard template. It has an attractive and fresh design with full responsiveness based on Bootstrap framework. Intuitive codes with LESS based CSS inside. Top navigation bar with search box also included with it. Ample Admin encompasses all the needed basic components to build an admin theme. Moreover, features like widgets, dashboard overview page, charts, basic tables, and profile page are bundled with it. Developing with Ample Admin is as easy as a knife through butter. So, create with Ample Admin and have fun! Thank you for downloading Ample Admin.